Therefore, a formal dispute was put in because the correct procedure was not followed. This is not the first time this has happened, and it caused disdain for the individuals involved who were not given the opportunity to interview. We are still working to get every position advertised network wide so that everyone in V/Line is aware of what positions are available to apply for. The first option for the buffets in the new Vlocity trains was sitting at nine meters long. V/Line then came back offering two metres by two metres, so the buffet working party committee set up a risk assessment on the old buffets that are currently in the n-sets. The risk assessment showed there was hardly enough room in the current buffets, so V/Line therefore came back and offered four metres long, which with the correct design and layout of the new buffets should work out well when the new buffets are finalised. Another issue that we have also been dealing with is the V/Line shirts. It took a lot of work and negotiation to get the males to be able to order a blue shirt so they didn’t have to cook and sweat in their current shirts that are provided. The lavender colour shirts that staff were having to wear attracted a lot of dirt and dust, not making it a very good look to the public considering they usually are the front-line staff that the public see first. At the end of the day not many people care about the colour of the shirt, it is the materials they are made from as to whether these shirts are breathable or not. The current shirts are not very breathable and therefore make it uncomfortable to work in. The main thing they need to get right is having a comfortable uniform to work in and not have them made cheaply. We are hopeful that a uniform working party will be set up to get these shirts done properly once and for all i.e. colour, materials and length. 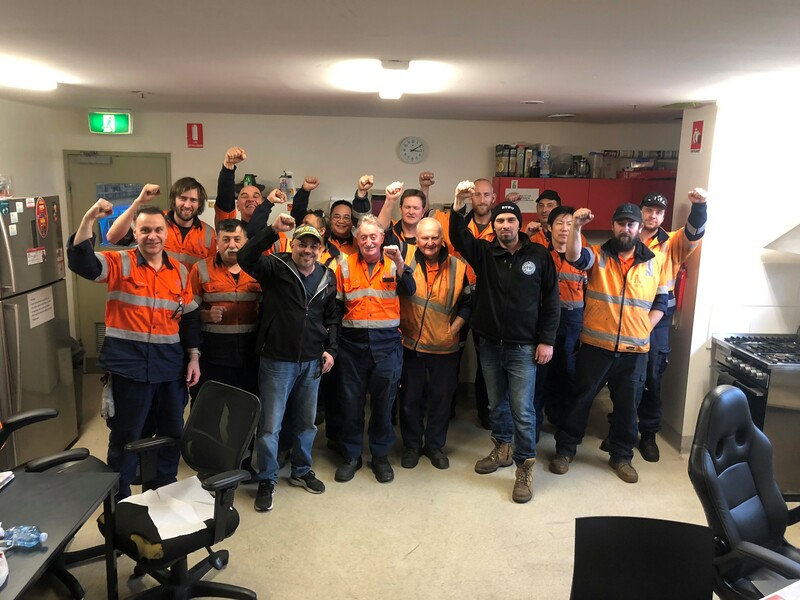 There was also a new service being introduced to Shepparton and discussion occurred as to where trains would be stabled in Shepparton overnight as well as push backs being involved. There was frustration from the SO3 station staff as they were being required to perform these duties and be in charge of these push backs. The problem was that these duties are not in their job descriptions. After numerous meetings with management it was agreed they were doing extra duties and responsibilities, so in the next EBA we will have to introduce a new position of an SO4 to compensate all these extra responsibility’s and duties which will affect many other staff in regional areas. Also in Shepparton there were massive issues for staff to safely perform these new push backs in the Shepparton yard with fencing and lighting that we had agreed in writing from V/Line would be fixed, that had not been fixed yet. There were issues of trespassers crossing the yard day and night as the current fence is so run down it would not be worth fixing and the last thing that anyone wants is staff dealing with trauma from hitting someone in the yard. After a few meetings it has now been agreed that the existing fences on either side will be upgraded with razor wire on top of it. There will be extra poles and lighting to be extended at both ends of the yard to light the whole yard up so these new push backs can be done safely. The new fence and lighting hopefully will keep trespassers out of the yard and help protect V/Lines rolling stock from vandalism and protect our members from any incidents. Over the last few months, Metro Trains Melbourne (MTM) have ramped up their rhetoric on fatigue and the need to change rosters. They have held information sessions with members, consultation meetings (the RTBU was unavailable that day) and even tried to set up committees in order to quell this so-called imminent risk to health and safety. These are the same rosters that MTM wanted so desperately back in 2012 that may or may not have accidentally been under costed. Is it because MTM are trying to save money? Rolling stock has a roster change process in schedule D, why don’t MTM just use that? Good question, Schedule D exists specifically for the purpose of altering rosters, it even specifies that fatigue must be factored in to any roster outcome. My best guess is that MTM know too well that the changes they intend to propose won’t be voted up by union members through that process due to a reduction in pay. Doesn’t the RTBU care about fatigue? Of course the RTBU cares about fatigue! The health and safety of our members is paramount. The reality is however, that MTM have the tools available to them right now to manage fatigue better if they feel there is an “imminent risk”. Surely if MTM believed that there were sections of the roster that proposed a significant risk they would simply send people home with pay for the hours affected. Why don’t they? Well either these sections of the roster don’t exist, or they don’t want to be financially worse off. Either way as stated earlier schedule D specifically takes fatigue into consideration during any such change, so why don’t MTM put a proposal on the table? Why are they doing it during Enterprise Agreement (EA) negotiations? There are lots of reasons why the company may do it now, potentially there is a fatigue issue, or maybe going through a “fatigue emergency” during an EBA provides the mother of all distractions. Members should be focusing on skills and job security this EBA not a divisive battle over rostering. If this is a genuine fatigue issue, why is modifying schedule D on Metro’s log of claims? MTM have identified that they wish to change schedule D to create a more “flexible” process to cater for, among other things, fatigue management. This would enable MTM to make changes with less red tape (red tape being defined as seeking agreement from the members). So to translate, MTM want to change your rosters as easily as possible, with as little input from you as possible. We recommend RTBU members do not partake or volunteer for any established fatigue committees set up to undermine the existing process. The reality is, we may, or we may not have a genuine fatigue issue to deal with. The RTBU’s message is simple, if MTM want to change rosters, there is an AGREED process. Cut to the chase, consult, put your cards on the table, propose your changes and members will decide. If members have any further questions about this, please feel free to give me a call on 0457 006 739. 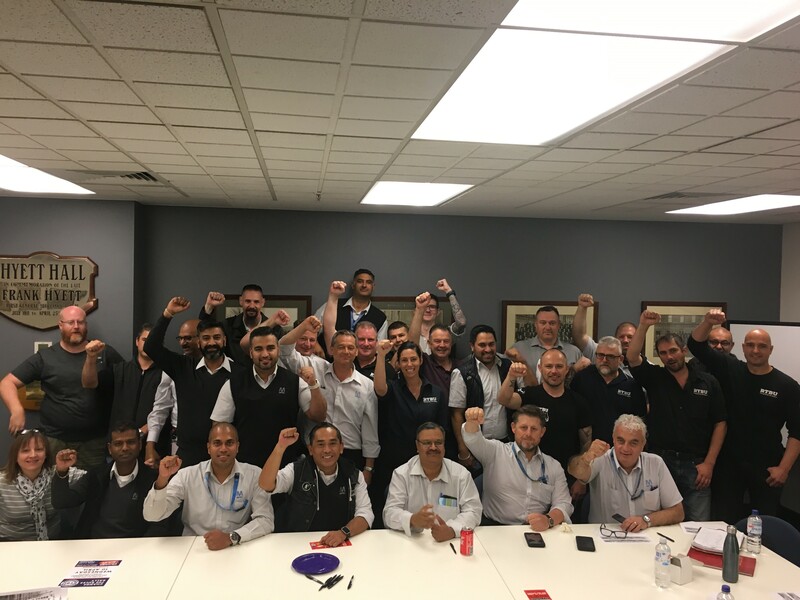 After many consultation meetings and working parties that have been developed over several years, all Authorised Officer (AO) Delegates and Health & Safety Representatives (HSRs) were invited to attend a Night Network roster meeting all together on Friday 29 March 2019. It was great to see such a high number of AOs show up for the meeting to discuss the rosters that have been ongoing for some time. The RTBU appreciates and understands that any change to rosters affects our members’ personal lives which is why there has been a working party from the beginning to ensure that this is done correctly. We also understand that while new rosters can be a positive change for the majority, we are never able to get 100% of the membership to be happy with it. Every single person has a different personal situation and we will continue to work towards the best possible outcome and roster for everyone. For those of you that don’t know, when Night Network was implemented in 2015, every area of rail got extra staff to accommodate for Night Network running, however the AOs received none. This has been a continuous issue since then because AOs are expected to patrol during Night Network however they never received additional staff to allow for this. Fatigue has been at an all-time high for the last few years because of this, which is why the working party has been making every effort to create a roster that best accommodates all members and therefore better manage the fatigue. The working party will continue developing the rosters and will update the affected members in due course as this progresses. If any members have any questions, please feel free to call me on 0407 512 494.